24 March 2007 (Jakarta Post) – I’ve just been reading about the Kadiri (Kediri) kingdom, which existed between the 11 and 13 centuries. King Prabu Joyoboyo might correspond with the King Sri Maharaja Sang Jayabhaya Sri Vermesvara, who reigned between 1134 – 1144, under whom the Kediri Kingdom reached its height. The rest of the article describes peculiarities of the Tondowongso site, in particular some exceptional statues that have been uncovered and their placement in the excavated temple complex that seem to differ from the other regional temples of the same period. Recent archeological discoveries at a Tondowongso excavation site in the East Java town of Kediri have opened the possibility that the once-glorious Kadiri Kingdom was located in a nearby region. West of Gayam village in Pagu district, archeologists also discovered the personal remnants of Kadiri King Prabu Joyoboyo. Archeologists believe the site, said to be a temple, which has since been converted into a meditation area by locals, is closely linked with Gayam village. An epigraphist at BP3, Ririet Suryandani, said a toponymic analysis could be used to uncover the exact location of the Kadiri Kingdom. “We can determine the exact location of the kingdom from studying the hundreds of historical statues found,” said Ririet at the excavation site. 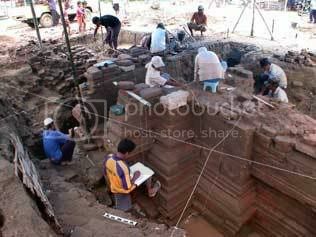 Ririet believes the discovery of an ancient inscription at the Tondowongso site could also explain the function, name and purpose of the historical building, adding it could be presented in various forms, such as on an encrypted stone, bronze or gold plate.